For the first 6 or 7 years after moving away from home my TV was a little 13″ box that my parents bought for me. I could pick it up with one hand using the built in handle on the top. It was never a concern when I moved to different rooms or apartments. Then I upgraded to a 27″ hulk of plastic and glass. It was right on the edge of me being able to pick it up and move it. I would have to pre-plan the route I would take and double check that no obstacles were in the way. Carrying it up stairs was the worst because my ribcage would surely be crushed if I somehow fell backwards. 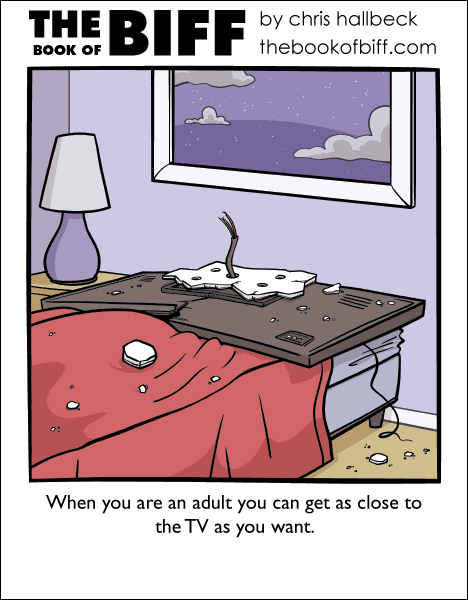 That one commercial where the couple put the tv on the ceiling bothers me. Biff cleary shows the aftermath. The things that happen at 3 in the morning… ._. Grew up with one of those. Dad bought it so we could watch the moon landing in color. (well that was the excuse anyway). After a while we stopped trying to move it at all. Too hard to lift it out of the holes it sank into the hardwood floor. This reminds me of a man who won a Darwin award for doing what Biff probably did. More like “flattening” screen TV…. Gravity: not just a good idea. It’s the law. Why do people stick TVs on walls with those flimsy looking arm things that look like they will snap any moment and shove £500+ down the drain? I mean, if I had an expensive TV (*which I don’t*) then I would want it to be SAFE, not hanging for dear life from a thin piece of metal! Ow. Even his eyebrow looks limp after that.